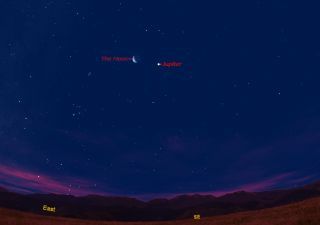 The moon and Jupiter will appear near each other in the predawn hours of Sunday, July 24, 2011. This sky map shows how they will appear in the southeastern sky at about 5 a.m. local time from mid-northern latitudes. If you look up at the sky early on Sunday (July 24), you may be attracted to an interesting apparition above. Two of the brightest celestial objects, the brilliant planet Jupiter and the shining moon, will team up. Jupiter — largest of all the planets in our solar system — rises above the east-northeast horizon at around 12:30 a.m. local daylight time and currently shines at magnitude -2.4. On this astronomers' scale, smaller numbers represent brighter objects, and larger numbers are dimmer ones. To gauge just how bright Jupiter is, keep in mind that Sirius, the brightest star in the sky, shines a full magnitude dimmer at magnitude -1.4. So Jupiter currently shines at a brightness that rivals Sirius by just over two and a half times. The sky map here shows the moon and Jupiter as they will appear before dawn on Sunday morning to skywatchers with clear weather. On Sunday morning, look for Jupiter to be hovering about 6 degrees below and to the right of a relatively wide waning crescent moon. Since your clenched fist, held at arm's length measures roughly 10 degrees, the moon and Jupiter will be separated by a little over half a fist. They will appear to rise next to each other. By 4:30 a.m., with the glow of the approaching sunrise just beginning to brighten the sky, the moon and Jupiter will appear side by side, having risen to a point roughly half way between the east-southeast horizon and the point directly overhead (called the zenith). If you have a telescope, or even binoculars, Sunday morning would be just about the best time to observe the moon with a telescope. This would also be a very good time to study Jupiter, the gas giant, in clear and steady air. However, you'll have to go out later in the wee hours when it has climbed high in the southeastern sky before dawn. Binoculars show a tiny disc, but a good telescope resolves Jupiter into a series of yellow, tan and brown shaded bands. In addition, Jupiter's four largest satellites run a merry race with each other around the planet, changing their respective positions from hour to hour and night to night. On Sunday morning, three of the satellites – Callisto, Europa and Io – will be seen on one side of Jupiter, while Ganymede stands like a lonely sentry on the other side. Finally, keep in mind that while the moon will be 249,000 miles (401,000 km) away, "Big Jupe," is 463 million miles (745 million km) out in space from our earthly vantage point. If you snap some great photos of Jupiter and the moon together and would like to share them with SPACE.com for an image gallery or story, please contact SPACE.com managing editor Tariq Malik at: tmalik@space.com.